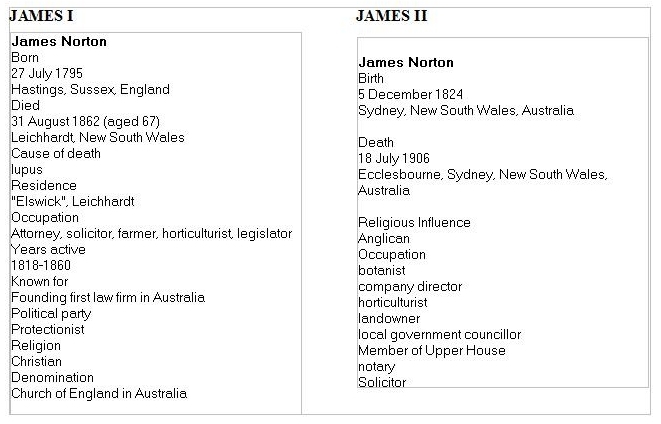 James Norton I (27 July 1795 – 31 August 1862) was a solicitor and public figure in early colonial New South Wales. Admitted to practise in England, he arrived in Sydney in September 1818. First wife Jane Mackenzie. James Norton II (1824-1906), solicitor, was born on 5 December 1824 in Sydney, eldest son of James Norton and his first wife Jane, née Mackenzie. On 1 June 1854 at Longford, Tasmania, he married Harriet Mary (d.1860), daughter of deputy commissary general Thomas Walker, and in 1859 bought Ecclesbourne, Double Bay. On 31 December 1862 he married Isabella, sister of Professor W. J. Stephens. Edward Norton m. Alice Wilkenson (who was left with a Wilkenson family in Sydney. Her parents (name not known) disappeared en route to India. 10. Ethel m. George Waller? “Billy” (Fa-fa) Norton (Betty's father) had little education because of working on the “Tiara” property. He managed “Blithswood”, Quirindi, NSW (owned by his grandfather). Married to Helena Hague-Smith, Betty and all her siblings were born there. There was a family feud over the “Blithswood” property. Two girls sold their portion. Billy thought he had inherited the whole property. Billy was given a small home in Walcha sold to Walter. He moved to “Limber”, near Tamworth, which he bought. Then to Armidale, He built a house “Moor Park” on 40 acres with Cherry Orchards and 2 other fruits. Also an Apiary and a Metal Quarry. On his small portion of “Tiara” he lost his sheep when they ate sheep dip powder. In ill health he got a block of flats in Manly where he and Helena lived. The business side was managed by Ted. He had osteoarthritis in the hip and died aged 82 . At one stage he had 2 properties in Elizabeth Bay. The agent who collected the rent went bankrupt. Billy got about 1/- in the pound. Helena (Nan) lived on her own in a flat at Northwood until about age 83, then lived with Betty. There is a booklet titled The Norton's of Sussex (Eng) and New South Wales which you can read on Google and has a tree of Edward's ancestors. Smith fought during the Maori wars and was rewarded with a block of land on Auckland's waterfront at Northcote. He arrived in New Zealand in 1859 and established himself as an Ironmonger and shipowner based in Auckland. He minted the first pennies. The Museum Victoria catalogue gives an approximate year of issue for his tokens as c.1862. He moved to Sydney in 1872 and lived at “Sherbourne”. Nelson St., Woolahra. He became a director of the Colonial Mutual Life Insurance Company. Marianne Lomas born in Sheffield, England in 1816. Mary Ann Smith wife of Samuel Hague Smith was buried in 1872, in the Weslyan section of Symonds Street Cemetery, Auckland.